This photograph was taken in Alichur, a village situated on the Pamir Highway south of Murghab in the Gorno-Badakshan Autonomous Region of southeastern Tajikistan, and comprised mainly of Ismaili Muslims. 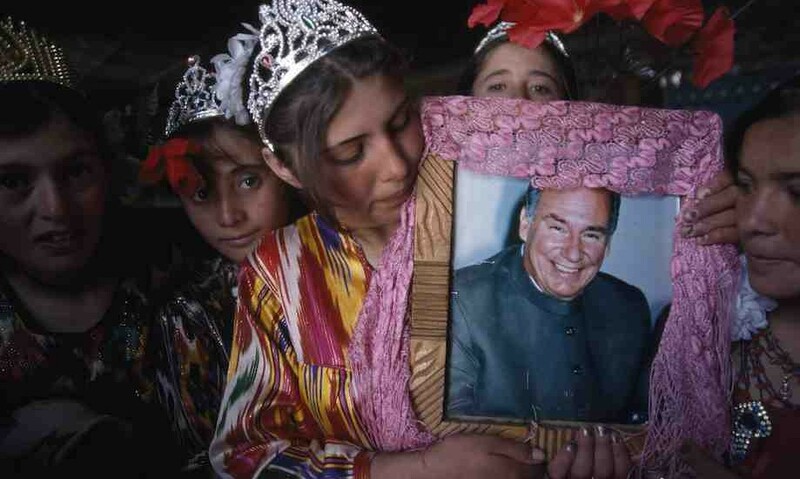 The photograph was taken during Didar (‘Invitation’), a celebration that takes place on 28 May every year and commemorates the anniversary of the Aga Khan’s visit to this village in the late 1990s. During the celebrations the villagers dress up, dance outdoors to the accordion and drums and sing ginane (religious songs about the Aga Khan), which tell of him being their noor (light). The photograph was taken as these girls, dressed in bright atlas silk fabric with crowns on their heads, were going out to dance. His Highness the Aga Khan is the forty-ninth hereditary Imam (spiritual leader) of the Shi‘i Imami Ismaili Muslims, a community of ethnically and culturally diverse people living in twenty-five countries around the world. A Harvard graduate in Islamic History, the Aga Khan succeeded his grandfather as Imam of the Ismailis in 1957 at the age of twenty, and is currently celebrating his Golden Jubilee year. Over the past fifty years, the Aga Khan has led a unique effort to improve the lives of Ismailis and the communities amidst whom they live through the Aga Khan Development Network, which broadly promotes economic and social development as well as culture in order to help these communities achieve a level of self-reliance. It is a contemporary endeavour by the Ismaili Imamate to express the social conscience of Islam through institutional action. The network of non-denominational organisations has brought decent health services, education, jobs and better living conditions to hundreds of thousands of vulnerable people, often in the most deprived corners of the world – including the Gorno-Badakshan region of Tajikistan. For the inhabitants of that remote mountainous region at the heart of the Pamirs, the Aga Khan is a highly revered figure. Pictures of him hang in every house, and Aga Khan-related institutions play a fundamental role in the community’s survival and development. For more information on the Aga Khan Development Network, see www.akdn.org.